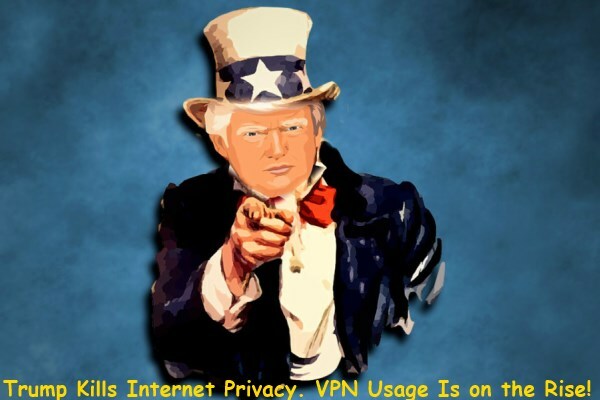 President Trump has signed congressional legislation that allows ISPs tracking and selling its customers’ browsing history, online information and habits to the highest bidder. Everything you typed into a web browser can be used to create highly targeted online ads. Technically it’s already legal for ISP, such as Comcast, to track and spy on customers and sell data to advertisers. Facebook and Google do the same now too. But many ISPs had delayed following Facebook and Google’s lead because the Obama administration’s Federal Communications Commission took a hard line on net neutrality and other consumer protections. Due to this fact VPN usage is skyrocketed. The advice to use a Virtual Private Network (VPN) to protect your privacy has dominated in US media now. 90,000 users have registered at Trust.Zone during the last 24 hours and the number of new customers still grows...We recommend being more aggressive with placing Trust.Zone ads on your websites because there is a high peak of VPN usage right now. Our team prepared high conversion banners and embedding codes for you here (you should be logged in). Besides, our team added new promo, banners, popunders and warning alerts. Winter Final Sale! Boost Your Earnings Right Now!US Senate voted to let ISPs sell customers' web browsing history. VPN usage is skyrocketed!